In January 1908, he was arrested for breach of the registration law and clapped into prison. The following month he was released after an understanding seemed to have been reached with the government. A few days later, he was beaten up and severely injured by a compatriot, who accused him of betraying the Indian cause. At the onset of the South African War, Gandhi argued that Indians must support the war effort in order to legitimize their claims to full citizenship, organizing a volunteer ambulance corps of 300 free Indians and 800 indentured labourers called the Indian Ambulance Corps, one of the few medical units to serve wounded black South Africans. He himself was a stretcher-bearer at the Battle of Spion Kop, and was decorated. At the conclusion of the war, however, the situation for the Indians did not improve, but continued to deteriorate. In 1906, the Transvaal government promulgated a new Act compelling registration of the colony's Indian population. 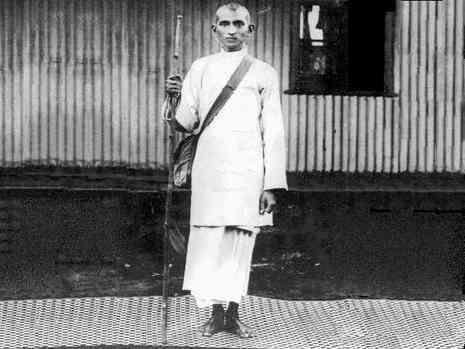 At a mass protest meeting held in Johannesburg on September 11th that year, Gandhi adopted his methodology of satyagraha (devotion to the truth), or non-violent protest, for the first time, calling on his fellow Indians to defy the new law and suffer the punishments for doing so, rather than resist through violent means. This plan was adopted, leading to a seven-year struggle in which thousands of Indians were jailed (including Gandhi himself on many occasions), flogged, or even shot, for striking, refusing to register, burning their registration cards, or engaging in other forms of non-violent resistance. While the government was successful in repressing the Indian protesters, the public outcry stemming from the harsh methods employed by the South African government in the face of peaceful Indian protesters finally forced South African General Jan Christiaan Smuts to negotiate a compromise with Gandhi.